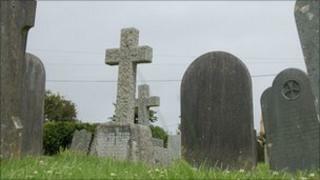 Plans to stack bodies in graves because of a shortage of burial plots have been backed by the Church of Scotland. The "lift and deepen" scheme would see old remains being dug up, placed in a small container and re-buried at the maximum depth to allow more burials in the same plot. The Scottish government wants to modernise rules on death certification, burial and cremation. However, other faith organisations said they had concerns about the proposal. The Kirk's response to the official consultation stated: "This appears to be a quite reasonable and respectful process of making the ground available for future burials while seeking to accord appropriate dignity to those who have been interred previously." It also offered support for the re-use of lairs older than 75 years, with "appropriate safeguards". However, the Scottish Council of Jewish Communities said in its response that its faith regarded the human body as sacrosanct before and after death. Its submission added: "We have serious concerns with the proposals to re-use graves, particularly with the proposals that local authorities should be able to designate plots for re-use without explicit permission." The group said there is an "implied suggestion" in the consultation that cemeteries should be more concerned with aesthetics than with respect for the dead. A response from the Muslim Council of Scotland said the re-use of graves was acceptable "only if necessary". The Institute of Cemetery and Crematorium Management said re-use of old, abandoned lairs was the "only means" of ensuring the long-term security of cemeteries and burial grounds. The responses were among 102 received from clinical healthcare staff, local authorities, faith groups, the funeral industry, government officials and academics. Scottish government officials have not yet analysed opinions for the re-use of graves, and are currently focussing on death certification. This includes the introduction of a small number of medical investigators to scrutinise death certification and the replacement of the current cremation fee of about £142 with a more "modest" fee. Proposals put forward would also allow trained clinical staff, including nurses and paramedics, to verify that a person has died. Public Health Minister Shona Robison said: "This consultation relates to matters that affect every one of us and it is important the Scottish public have had a chance to voice their opinions."